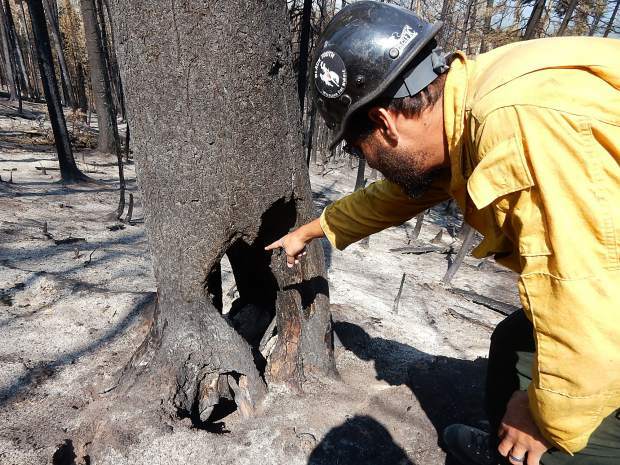 Jason Rodriguez, former type 3 incident commander on the Lake Christine Fire, points out Wednesday where fire burned inside a fir tree and hollowed out the trunk. Hundreds of such dead, standing trees known as snags line Basalt Mountain's roads and trails. A lengthy effort befitting Paul Bunyan will be needed to get popular recreational routes on Basalt Mountain safe enough to reopen after the Lake Christine Fire ripped through the landscape last month. “That’s what worries me: How do you keep the public safe?” said Jason Rodriguez, a supervisor with the Black Tooth Wildland Fire Module crew and a type 3 incident commander trainee on the Lake Christine Fire. He and public information officer Steven La-Sky led a reporter from The Aspen Times on a tour of part of Basalt Mountain on Wednesday. The White River National Forest has closed the portion of Basalt Mountain within the fire perimeter for an indefinite time. Conditions will be assessed next spring, but the sheer number of dead trees that need to be cleared suggests the closure will be lengthy. From a parking area on lower Basalt Mountain to the upper Mill Creek Trailhead is about 3.5 miles. The landscape along the first third of the road is relatively unscathed. In the middle third, the fire left a checkerboard pattern where patches are charred and others mostly intact. On the last third, as the slope gets steeper, the understory was torched along with most of the trees. The once lush forest floor is now covered in soot and ash. 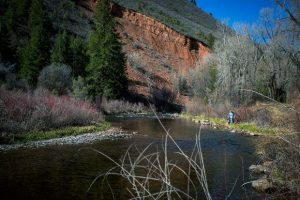 The upper Mill Creek Trailhead stood out pre-fire because it was the only break in the thick understory of grasses and brush — with aspen trees and sub-alpine fir towering over it all. Now it’s hard to spot because the trail is just part of the monotype landscape of ash. Denuded trunks line the trail. In one short stretch, Rodriguez identified five trees that pose a life safety threat. Firefighters won’t work around such trees because they are a threat to fall at any time. “I’m looking at two chains away — a chain is 66 feet — to be safe,” Rodriguez aid. The lower Mill Creek Trailhead trees aren’t charred, but it is apparent that just a few yards into the forest, the destruction is as extensive as it is above. From the Cattle Creek drainage, along Forest Road 509, it is clear that long lengths of the Cattle Creek Loop trail are devastated as well. Slopes that were once covered in thick, dark timber now are filled with an army of standing snags. Near the lower Cattle Creek Loop trailhead on Forest Road 509, Rodriguez shows where the Black Foot crew worked in extremely steep terrain to help save eight historic cabins and fire from jumping the road. Firefighters engaged in something similar to the “whack-a-mole” game with the fire in that area, Rodriguez said. The fire would flare up in one dense patch of forest and the firefighters would scramble to extinguish it, then the fire would spot to another patch of forest and force a reaction. The marching order to firefighters entering the field each day was “keep your head on a swivel” because of all the snags, Rodriguez said. 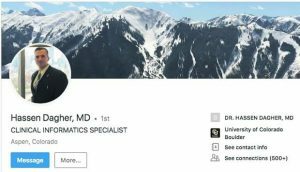 Aspen-Sopris District Ranger Karen Schroyer said firefighters have reported to her that they would hear snags crash down whenever the wind came up. 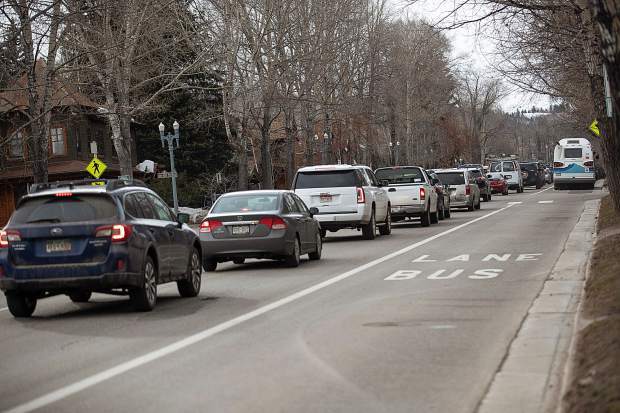 It will take a concerted effort to remove all the snags a tree-length away from the trails and road before the public will be allowed back on Basalt Mountain, she said. “The road is going to be the highest priority, without a doubt,” Schroyer said. The Lake Christine Fire, which started July 3, is holding at 12,588 acres and about 90 percent contained. Demobilization reduced the firefighting force to 40 personnel as of Friday. Forest Service firefighting funds are available while the blaze is still considered active to undertake rehabilitation of fire lines cut by bulldozers and hand crews. More than 40 miles of lines were created around the fire. 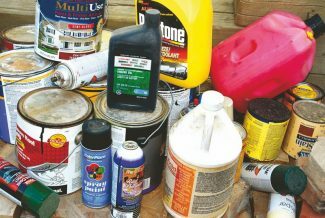 A team of Forest Service specialists called a Burned Area Emergency Response team is identifying steps the agency should take to protect life and property. Another team will work on a longer-term plan that looks at tasks such as revegetation, spraying for weeds and clearing the snags. The White River National Forest already receives extensive assistance from nonprofit organizations on trail clearing and maintenance. Roaring Fork Outdoor Volunteers and Roaring Fork Mountain Bike Association play critical roles in trails projects. Schroyer said the Forest Service will need their help on Basalt Mountain. “The reality is with us the funding might be slow,” she said. For now, the agency’s focus will be keeping the public out of the area that was within the fire’s perimeter. Mike Pritchard, executive director of Roaring Fork Mountain Bike Association, said the organization will be interested in playing a role in rehabilitating the Basalt Mountain trails at some point. The exact role and the timing will be determined after the experts assess the landscape, he said. Some riders who are familiar with the Basalt Mountain trails are optimistic about the future because the fire will open big views that were largely absent on the rides, according to Pritchard. Riding through a burned area will also provide an educational experience as people observe changes and a return of forest health over time. One aspect that will have to be explored is whether reroutes will be required where the trails are obliterated, he said. Pritchard said the sheer number of standing dead snags means it will take considerable time to get trails reopened. “We just need to tell people to be patient,” he said.